Oscar has developed squamous cell carcinoma, on his back, right above the tail. Oscar is a typical 26-year-old in the prime of life. Those closest to him would normally look forward to many more years of the pleasure of his company. But all of that comes into question with a diagnosis of cancer. Oscar has developed squamous cell carcinoma, a skin cancer that forms in the epidermis. It is on his back, right above the tail. Oh, we forgot to mention that Oscar is a Congo African grey parrot. African grey parrots have a long lifespan — up to 60 years in captivity and reportedly even longer in the wild. Fortunately, if addressed early enough, squamous cell carcinoma can be treated very successfully in parrots. The biggest challenge is that exotic pets — birds, reptiles and small mammals like rabbits and guinea pigs — do not get treated for serious illnesses as often as more common companion animals. Pet owners are usually more willing to invest the time and money required to treat dogs and cats than exotics. As a result, there is less experience to guide treatment decisions in these animals. Recognizing this problem, the Petco Foundation has provided the NC State College of Veterinary Medicine with a generous three-year grant to defray the costs of treating cancers in exotic animals, encouraging owners to seek help. The goal is to encourage veterinarians to learn more about the most effective methods of treatment for these patients. Oscar is one of the beneficiaries of the Petco grant. 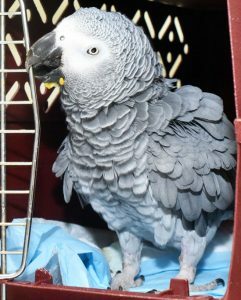 Oscar, a Congo African grey parrot. Oscar’s owners, Jim and Noreen Hayes of Raleigh, have had Oscar all of his life. They purchased him from a breeder when they lived in Massachusetts, picking him out while he was still inside the egg. “The whole family is crazy about him,” said Jim Hayes. “He talks up a storm, he whistles. He even imitates the dog. And he has a long memory. He repeats things from years ago. Noreen Hayes said that one time spaghetti fell on kitchen floor and the family dog started to eat it. Oscar commanded, “get out of here,” and stepped in to help himself while the chastened dog stood aside. Oscar’s cancer affects the uropygial gland, also known as the “oil gland” or “preen gland.” Typically, birds collect oily or waxy secretions from this gland with their beaks to groom their feathers and skin. 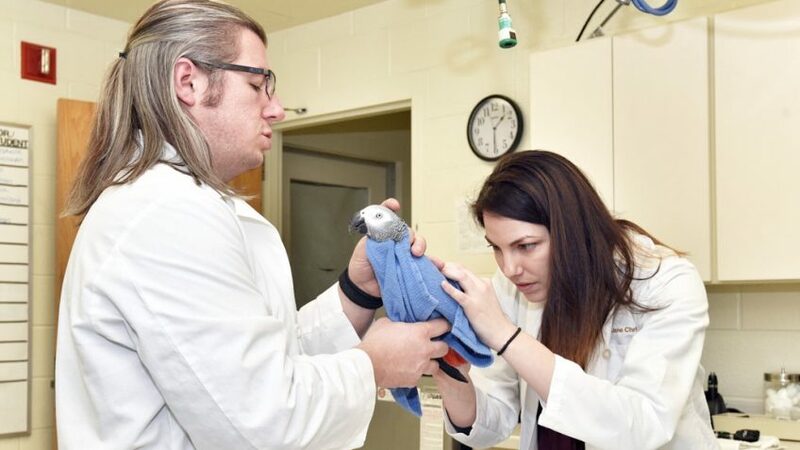 The NC State Veterinary Hospital’s exotic animal medicine service has seen more advanced cases of squamous cell skin cancer in this gland spread to the spinal area. When this happens, a bird’s life is more at risk. “A couple of months ago we noticed some bleeding,” said Jim Hayes, “and we know that is serious with birds.” That day, they took Oscar to the emergency service. The tumor was large but not as advanced as more serious cases. It was surgically removed by Jeff Applegate, clinical assistant professor of avian-exotic animal medicine, and the EAMS team. When Oscar returned to have his sutures removed, things seemed to be healing well, with no sign of tumor recurrence. A follow-up visit in late March found that Oscar was progressing well. Future follow-ups will still be necessary, but Applegate is optimistic. That’s good news for the Hayes family, especially for Jim and Noreen Hayes’ granddaughter, Kimberly Hayes, currently enrolled in college in Oregon. She may be Oscar’s biggest fan, regularly checking in on him via Skype. Oscar inspired Kimberly Hayes to pursue the study of birds; she even taught him some wild bird calls to add to his vocal repertoire. Thanks to Oscar, there’s a new generation of bird lovers on the horizon in the Hayes family.